I’ll often hear humans lamenting that they were “born (fill in the blank number) years too late” because they relate better to the nostalgia of the past than they do to the present day. I always thought that was a load of hogwash until I realized that I, too, wish I had been alive in Disneyland between 1955 and 1982. It’s true, I wouldn’t have had access to Twitter, but I could have enjoyed an ENTIRE RESTAURANT DEDICATED TO TUNA!! 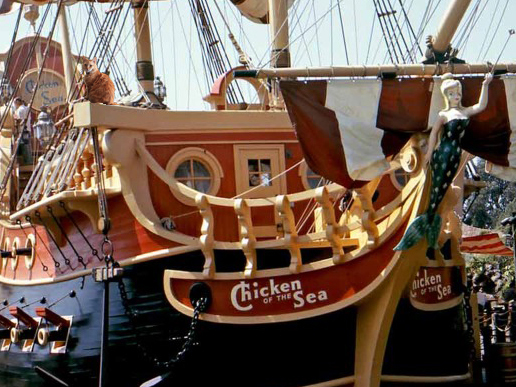 As you can see in the photo above, the Chicken of the Sea Pirate Ship and Restaurant was a veritable mecca for Disneyland Cats during the park’s first few decades. I’m not even joking when I say that the kitties of yore could have enjoyed scraps of uneaten tuna burgers, tuna sandwiches, and hot tuna pies. While the ship sat in it’s Fantasyland location, the cats could often be found on the poop deck. No, that isn’t a nautical term—it’s just what we’d call the deck on which we did our business. Once Skull Rock was added next to the restaurant, our ancestors would often take whatever food they managed to steal back to the skull’s left eye and feel free to dig in without being subjected to judgmental human stares. Today, the location where the Chicken of the Sea ship once stood is occupied by Dumbo the Flying Elephant. I’m all for flying in circles on a pachyderm, but I think we can agree that no elephant is ever going to hold a candle to a tuna-scented Disneyland classic. Great! Wonderful! To bad it is gone, but check Jolly Holiday for more tuna. This was by far your best blog to date. Made me laugh out loud. Literally. I am old enough to remember it. I ate there on 17 July 1980, during the 25 hour party celebrating the parks 25th birthday. Also, “poop” (as in “poop deck”) is indeed a nautical term. I believe that it comes from the Latin “pupus” which means a statue or doll. Ancient ships had a religious icon on the afterdeck, which was the location from which the ship was commanded.